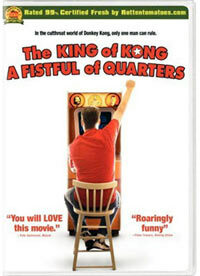 The King of Kong: A Fistful of Quarters follows the pursuit of a classic video game record. In the process, Billy and Steve discover there's a lot to be learned about life while competing to be the best at Donkey Kong. Director Seth Gordon explains, "When producer Ed Cunningham and I first conceived of a documentary following the pursuit of a classic video game record, we had a very simplistic vision of the way the story might play out. We would follow the rivalry between two men on one of the most hotly contested arcade titles of all time, Donkey Kong. As we looked deeper a far more troubling (and ironically far more universal) story emerged. What started as a portrait of a competition turned instead into a portrait of two competitors, and the many agendas that took shape behind the scenes that bolster their rivalry. These two great gamers, one Salieri, the other Mozart, have grown to despise and fear each other and in so doing alienate the only person truly capable of appreciating their own achievement and greatness." Francesco from Hobby Blog says, "I just found Retro Kanban, a fascinating web site dedicated to old Kanban. 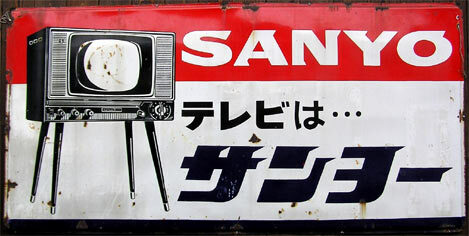 The Japanese word "kanban" means "shop sign", "signboard" or "billboard". This site carries a collection of enamel signboards, which were familiar from the 1930s to the 1970s but are rapidly disappearing." Jewelry box? Tombstone Radio? Miniature casket for Rudee Valley? Almost! Found on a recent visit to the New York City flea market in Chelsea, I almost passed on this gem thinking it was a run of the mill jewelry box. But as I looked closer I noticed the gold frame and small porthole-esque window alluding that this was more than meets the eye. 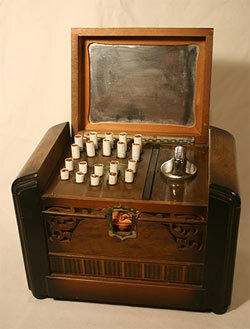 Turns out this amazing mechanical marvel is an inlaid wooden cigarette box, complete with dancing cigarettes, alternating blinking colored lights, and music box. Not to mention a mirror and all around good time. As if all this weren't enough, it also includes a lighter and revolving display of images which show through the front porthole/radio dial window. These "views" snap into place every few seconds, and show a different view of Asia with each pass... and the images illuminate as well.. whoa! This cigarette dispenser/virtual jukebox set me back a whopping $32 and I was so excited I couldn't wait to go home and open this box of magic to see how it ticks, er in this case whirs. Inside is an elaborate yet quaint series of wires and small colored bulbs, connected to various metal tabs. These tabs help alternate the low voltage current (making the lights blink alternately) by touching a series of revolving pegs, spun by the music box movement, which is also responsible for the teeter totter motion of the dancing cigarette platform, and spinning front image display.... yeesh! 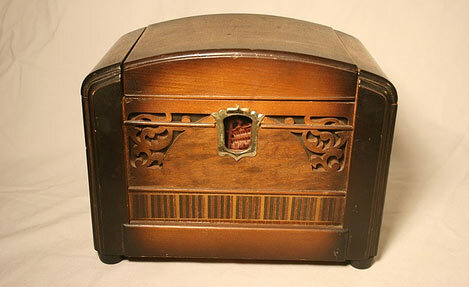 I have found very little information about this amazing beauty online, thought I do remember seeing a website that said these were souvenirs of Asia from the 1930's through the 1950's. 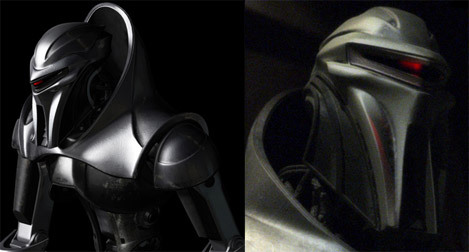 If anyone has more info on the manufacture or images of various models, please leave a comment and let us know! Wim Robberechts in Belgium sent us this amazing ARRI family portrait a few months ago. His company specializes in breathtaking aerial filming on HD and film. 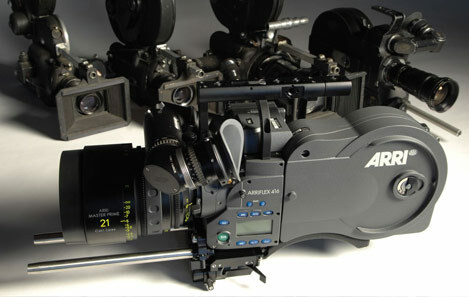 ARRI is a German camera manufacturer with a long and distinguished history. 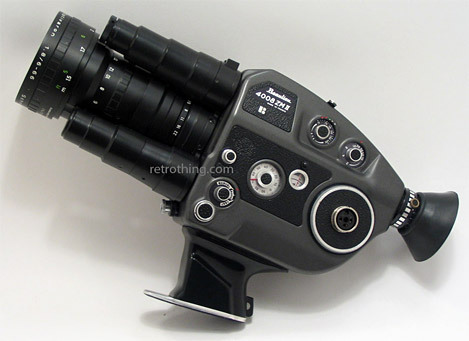 They introduced the world's first cine camera with a rotating mirror viewfinder system in the 1936, and have produced thousands of professional motion picture cameras since. The sleek little ARRI 416 Super 16 camera (foreground) is their first all-new 16 mm design since 1976. It weighs a mere 5.5 kg, including camera, loaded magazine, viewfinder and video assist. 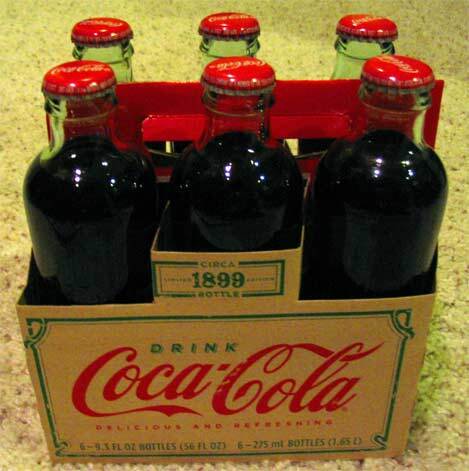 1899 Coke bottle design: At a store near you! Tony Wisneske writes: "I went to my local Vons recently and checked the soda aisle to see if they had Coke in bottles (the last time I checked, they didn't). I didn't see any bottles amongst the cans and plastic bottles but at the very end of the aisle there was a big stack of cases of these. Too bad this is a limited edition thing. I wish it was forever!" A steaming hot mug of Dr. Pepper, anyone? WPIX is a New York TV station with a long rich history going back to 1948. Like a lot of independent stations, they've had their share of local sports and Three Stooges frolics, but in 1966 they started a tradition that put them on the map; The WPIX Yule Log. Canceling $4000 worth of advertising on Christmas Eve 1966, WPIX broadcast a jumpy 17 second film loop of a roaring fireplace accompanied by several hours of "easy listening" holiday music (borrowed from the radio station owned by the same company). There were no ads, no announcers - it was WPIX's Christmas gift to their viewers so they could enjoy the warm orange glow (or gray if you didn't have a color set yet...) of a roaring fireplace. The broadcast was a massive success that became a New York tradition for the next 23 years. WPIX even staged a reshoot of the fire footage in 1969 to create a longer loop on lovely 35mm film. Despite its popularity, management extinguished the Yule Log in 1990, no longer willing to miss out on a Christmas Eve full of lucrative advertising. 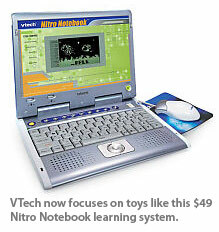 They offered a version on the internet in 1997, but it seemed that the annual TV holiday fire had gone out forever. 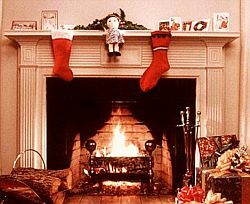 In the low spirits of December 2001, New Yorkers were warmed by the return of the Yule Log to the airwaves, thanks to the efforts of Joseph Malzone and his friends at theyulelog.com. The six minute Yule Log loop was unearthed from the film archive (it was misfiled as The Honeymooners episode "A Dog's Life"), digitally restored, and has resumed its place as the most watched Christmas TV program in New York. Even the music is identical to the original broadcast - some of the tunes have never been available on CD, so many have been remastered from LP's! Other stations now simulcast the Yule Log (you can find it on WGN Superstation nationwide in the US) - some even in HD. There is a downloadable "Portable Yule Log" and the special's 40th anniversary last year was marked with an hour long retrospective "It's a Log's Life" (taken from The Honeymooners episode title above). Today's TV landscape is a very competitive one, with the technology bar constantly rising. Isn't it charming that something this simple can become a cherished tradition - one that even the writer's strike can't ruin? Old time broadcasters talk about television being an honored guest in people's living rooms, and the Yule Log makes a welcome change from the usual cacophony of commercial TV this time of year. I find it heartening that for one night, at least one station can find it in its heart to give a video gift just for the sake of giving it. Read all about The Yule Log and its recent comeback! We've discussed the various video format wars on Retro Thing. The most popular was VHS versus Beta, a battle so popular that it's still used as an example in marketing classes, and even spawned an indy rock band. 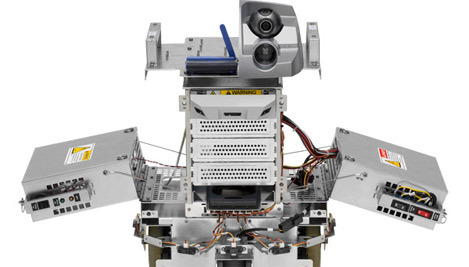 We've also talked about some of the other video formats that have been forgotten since, and there are a lot of them. This is one I'd never heard of before, and in a lot of ways it shows that the media companies just haven't learned a damn thing in the last thirty years. The format is called Cartrivision, and it dates all the way back to 1972. 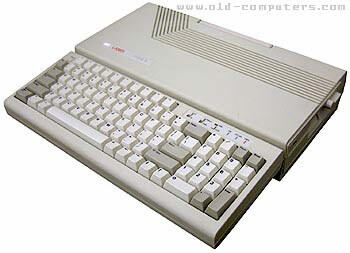 It was the first such format developed and sold in the USA. The unusual carts are square - the reels are one atop the other inside. 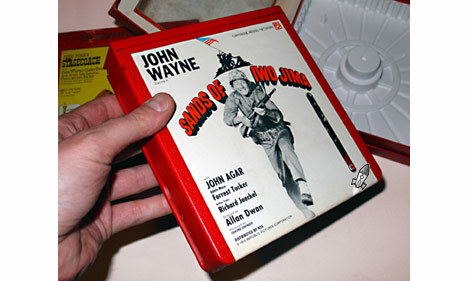 It recorded only every third field of video and displayed it three times - a clever way to use the technology of the day to yield a decent picture and still fit a whole movie into the 8 inch square cassette. The player was built into a number of specially made televisions, making the buy-in a hefty $1350 (nearly $6800 in today's money). Blank carts could record TV shows using the inbuilt timer, and there were pre-recorded movies and special interest programs. Since there were no corner rental stores, you'd choose your film (the advertising copy does mention the availability of adult films, no surprise there...) from a catalog and the cartridge would be shipped to your Cartrivision dealer. You couldn't buy feature films to keep, nor could you rewind the cartridge at home. If you wanted to watch the movie again, you'd have to take it back to the dealer and pay a fee to re-rent and rewind the flick. Why? Cartrivision was developed in cooperation with the film industry, and these were the stipulations they placed on this new home-based movie experience. It does smack a lot of the many current format wars, and the tyrannical terms of digital rights management. To be fair, home movie rental was unfamiliar turf for the studios back then, and at that point they made all of their money from a film's theatrical release and possibly a rare showing on TV. Check out the original marketing film below. 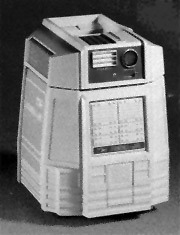 The carts recorded television broadcasts in color, though the available accessory camera only shot black and white (a limitation of the camera, not the format). Cartrivision quickly failed financially - a combination of the system being unrealistically expensive and a whole warehouse of pre-recorded movies ruined by heat. The format seems to have deserved the death it received. It was the vanguard of home video recording using a convenient cartridge, but the price and the restrictions on movie rentals made Cartrivision consumer unfriendly. 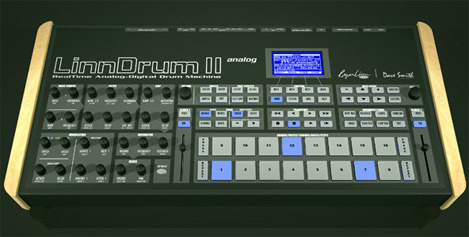 The company went bankrupt about two years after the roll out of the format, and many of the unsold components went into the surplus market allowing experimenters to fool around with video recording years before it was commonly available. 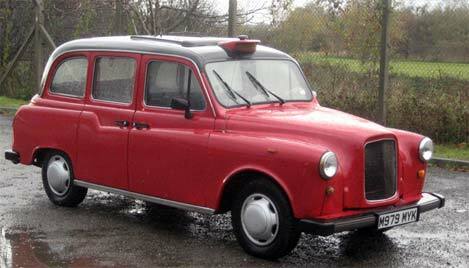 Here's your chance to pick up a well used London black cab. You won't be able to carry passengers for hire (in London, at least) but you will certainly own a distinctive vehicle. Elite London Taxis sells between 50 and 100 of these cars every year, with prices starting at less than £2,000 ($4K) for a 1991 LTI Fairway Taxi in slightly shabby condition. Most of these vehicles feature a 2.7 L engine mated with a 3-speed automatic transmission. Surprisingly, these frumpy old matrons can manage a top speed of 70 to 75 mph. Their mileage is guaranteed to be astronomical (100 to 150 miles per day of their lives), but chances are that they were reasonably well looked after by their owner/driver. After all, these vehicles were quite literally their bread and butter. 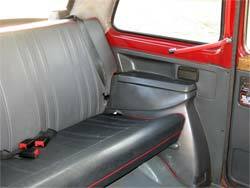 Elite London Taxis ships worldwide, although it seems from their testimonials section that the majority of their machines make their way to continental Europe, where they begin a second life as a wedding car or promotional vehicle. The folks at Lands' End have generously provided our final giveaway of the season, a special edition Lionel train set featuring scenes from the award winning film It's a Wonderful Life. 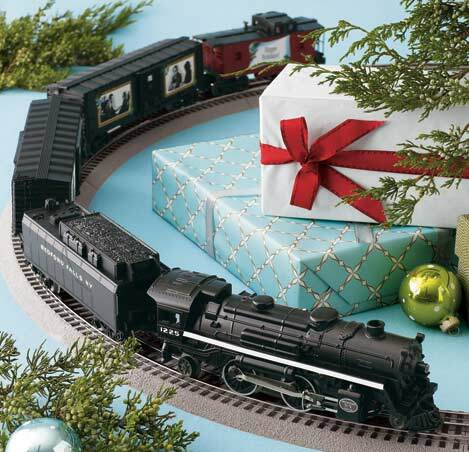 This beautiful $299 O-Gauge set hearkens back to the days before video games and computers, when kids dreamed of a train set under the tree. This set doesn't disappoint with a genuine die-cast metal locomotive, two cars with opening doors and a classic red caboose. Bohus couldn't resist taking a look inside the box and gleefully reports that the engine features a real air whistle, puffing smoke and an illuminated headlamp. 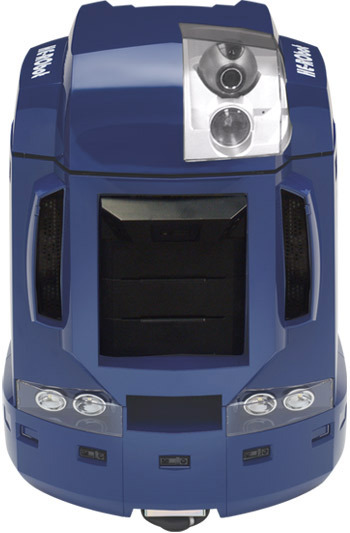 The set runs on AC power and features remote-controlled forward, neutral and reverse. 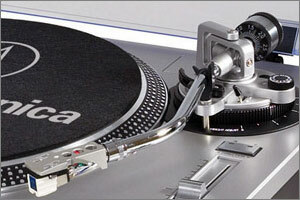 It also includes magnetic couplers, along with metal wheels and axles to ensure miles of trouble free service. The track features a textured roadbed to help keep everything in place. It's recommended for ages 8 and up, and I suspect grown-ups will have as much fun as kids! For your chance to win, leave a comment on this post letting us know how long you've been a Retro Thing reader, and tell us how you found our site (it's OK if you're new here, too). Only one entry per household. The contest closes at midnight Eastern on Sunday, December 23. We'll draw a winner at random on Christmas Eve and notify them by email. Because of the size of this item, the contest is open only to residents of the United States and Canada. We'd like to offer our sincere thanks to Lands' End, and I notice that you still have a couple of days left to shop their online catalog and qualify for standard shipping before Christmas. I don't usually mention my own eBay auctions, but I thought you'd like a chance to check out a few pics of my Beaulieu 4008 ZMII Super 8 camera before she sells. The French-made 4008 is one of my two favorite Super 8 cameras (the Canon 814 XL-S is the other). The 4008 was introduced in the early 1970s with several semi-pro features including a stunning Schneider Kreuznach interchangeable lens and manual film speed adjustment, which comes in incredibly handy when using modern high speed negative film. 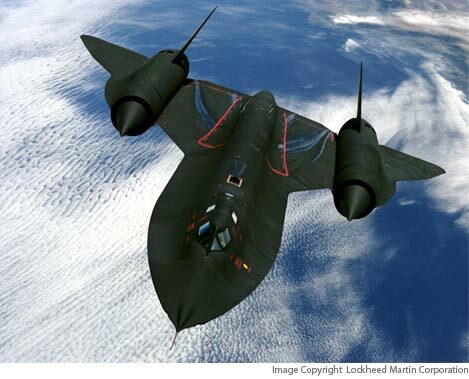 However, I'm not ashamed to admit the real reason I love this thing is that it looks like the kind of device Flash Gordon would pack to kick Ming the Merciless into the next solar system.